Out of the blue my mentor asked me why I ranked politics lowest of the things I might want to do in Project O. I told her that I found it boring the way they discussed things by arguing. But the truth was, I thought politicians were fake people, who were fed their lines. Elspeth told me she liked what I’d been doing in the workshops, the decisions I’d been making, then went on asking “Do you wanna come meet the Prime Minister tomorrow?” It was the most casual way to be asked, like asking for a pen in class. I admit, I thought she was joking, and I kind of didn’t understand that she was being legit. Fast forward to the next evening. We walked into the venue, some important people gave us our name tags, I was told to put it on my right, I still don’t understand why it mattered. Inside there was this big screen projecting, so we could see what was happening. Scott; the Big hART boss, kept making me practice my handshaking skills, which, to be honest was making me more nervous. I was already so nervous, I was used to worrying what my peers were thinking about me but this was a whole other level, I was about to meet the head of the country! When the PM finally got inside, him and Brett Whitely gave these speeches, about some issues, I couldn’t see, and they used to many big words so initially I didn’t understand what the point they were trying to get across was. After they’d given their speeches we mingled with other important people until we got the chance to meet Mr Turnbull. We introduced ourselves. I told him I’d been part of workshops, building resilience in young women. All he replied with was “Are they working?” Mate, I know you’re tired but is that all you’ve got? But that just goes to show that he’s human, and isn’t fed his lines. He accepted myself, and the NW coast as Australians, part of his responsibility, but at the same time he is our responsibility, he’s a human being too. Seeing him as just a human being making change, gave me the spark to do something myself, build resilience, try things that were out of my comfort zone, just to see what I could do. 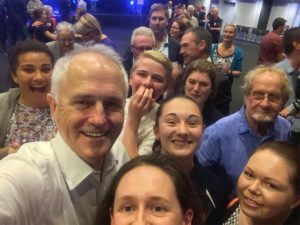 We kept mingling until it was announced that the Prime Minister was leaving the building, we quickly took the chance to get a photo with him, we got a formal one for the newsletter and we got a selfie. Elspeth was having some issues, trying to take the picture. Either he got sick of us or he wanted to show off his selfie skills, cos he decided he would take the photo. So technically the Prime Minister got a selfie with me. SNAP!